NaNoWriMo is National Novel Writing Month, the annual group challenge to write a novel, start to finish, during the month of November. 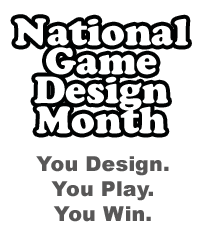 Nathan Russell would like gamers to adopt the idea with NaGe DeMon, National Game Design Month. The idea is to take a game from concept to playtested prototype in 30 days. A challenge indeed!